This is the best oatmeal bread I have ever made till now. I found the recipe from Quaker Oats site and reduced it for a single loaf and it turned out to be the best. Even with normal flour my breads sometimes turn out to be a disaster thanks to the yeast and other unlucky circumstances,so I was vary when I saw the recipe. But it turned out to be a keeper recipe and you get a healthy bread for breakfast or lunch or even perfect for croutons. In a big bowl,mix together 1.5 cups of flour,whole of oats,sugar,salt,and yeast. In another saucepan,mix together water,milk and butter and heat through till butter starts to melt or the mix is warm. Mix well so that the butter is well blended. Make a well in the flour-oats-yeast mix and put the warm liquid into it. Mix/beat well with hands or ladle or machine until moist for abut 3 minutes. You can see that the dry flour and oats absorb the entire liquid and it will look like a mass of porridge. 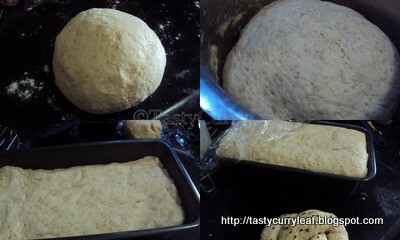 Add in 1 cup of flour more and beat/mix to get a moist sticky dough. Turn it out onto a floured surface and knead for about 5-10 minutes until smooth and elastic adding tablespoonful of flour as needed.It took me about 5-6 tbsp more to get an elastic dough. Shape into a ball and keep covered in an oiled/greased bowl,rotating once so that it gets coated with oil. Let it rice until doubled or about 30 minutes. Punch down.Cover and rest for 10 minutes,then form loaves and keep in loaf pan and then let it rise again for 15 minutes or until doubled. Bake in a preheated oven at 375F for 45-50 minutes until the top turns golden brown. Remove from the oven and place in the wire rack.Cool completely before slicing and serving. The bread looks excellent,professionally done- okay I am proud of myself,my baking confidenceis high thanks to it. But it is a bit crumbly.This could be because I might have cut it prior to completely cooling.But it tasted excellent.It was a bit heavy than I expected as oats is there and chewy. You can see that compared to the normal sandwich bread the air holes are lesser here. Well, the bread is perfect warm from the oven. It is also perfect with jam, cheese or any choice of spread. I cut the slices thick and found that they are best for a thick sandwich. You can also use them for puddings and also bake croutons from them.I loved the bread, I had made it twice. The second time, I removed about 1/4 cup of dough as I thought the dough is getting a bit constricted in the loaf pan and shaped it as a pretzel. The bread goes to BBD#34 : Grain Breads at Swati's kitchen,an event by Zorra. Bread looks delicious, I love oats in the bread. Thanks for sending it to BBD #34. Wow bread looks soo beautiful and scrumptious.. Yumm!! That bread does look amazing!! wow, that looks so fresh, soft and mmmmmm... delicious. I never let cool baked goods - when it is a cake my son urge to cut. bread I cannot wait to eat a hot slice! Looks good and healthy way to incorporate oats! This sounds fabulous Sweatha, made healthier with oats. Am getting very addicted to trying baking breads these days. Do try out this brand called Gloripan, it really works well!! Sounds and looks great. Well done. I have made something similar too but with whole wheat and rolled oats. I think the oats actually not only give the bread flavour but also make it more tasty than the regular one. Looks very good, Sweatha!